WHY HAVE PRICES INCREASED SO MUCH? – See our FAQ section for details. 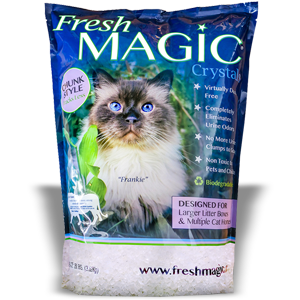 Fresh Magic CHUNK style Crystal Litter is PRIMARILY FOR USE WITH STANDARD LITTER BOXES, although some use it in automatic (electric) litterboxes. Chunk style is the national favorite for standard litter boxes. It does not roll far if displaced from the litter box. The chunks are a little larger (2 – 8mm) in order to help minimize tracking, and they seem to last longer than smaller sized chunks. Fresh Magic manufacturing standards produce a low-dust product. Healthier for you and your pet. 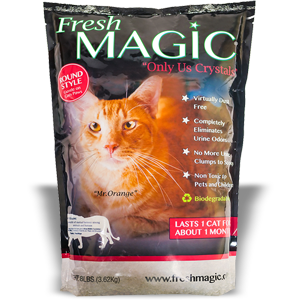 Fresh Magic ROUND style Crystal Litter is SPECIFICALLY DESIGNED FOR AUTOMATIC (ELECTRIC) LITTERBOXES. Round lasts a little longer than Chunk or Sand style and is compatible with all litter boxes. However, if a playful cat displaces the round crystals from the box, they roll far on hard surfaces. Round crystals are produced by a superior, more expensive manufacturing process. The ideal spherical shape does not break down quite as quickly as the irregular shaped. In part, this is because the irregular shaped crystals are crushed into smaller pieces, then sorted and sized. The Round crystals are produced by a different method which does not involve any fracturing of the original product. It costs more to do it this way, but it produces a superior longer lasting virtually dust-free crystal litter. 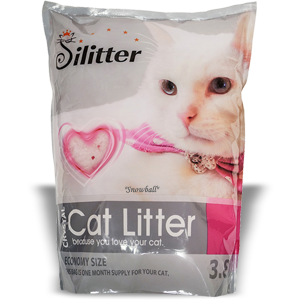 Silitter Crystals are medium chunk sized (2 – 6mm) crystals that work perfectly in standard or automatic (electric) litterboxes, and will not roll far or track much if displaced from the litterbox by a playful cat. These crystals have a slight strawberry scent for added odor control and are highlighted by the addition of strawberry colored crystals for a visually appealing look. This is a low-dust formulation, a feature we insist upon in the products that we sell. Healthier for you and your cat. Learn More What is crystal litter? The Truth? The litter industry can’t handle the truth – but they can sure mishandle it! All litter manufacturers know that the only drawback to cat ownership (other than vet bills) is catbox odor. And so every manufacturer makes exaggerated claims about the ability of their litter to control odor better than any other. The truth gets lost in a sea of wildly overstated claims and contrived TV commercials. The Space Age Technology of crystal litters defeats cat box odor better than any other type. From Wikipedia: Silica gel litter, often referred to as “crystal litter” is a porous, granular form of silicon dioxide, has the highest absorbency of any litter, and has excellent moisture control and complete odor elimination for an extended period of time compared to other litters. From Our Customers: They used to know I had a cat, now they don’t! Confused about the different types of cat litter: Clumping, clay, crystal, alternative? CONFUSED ABOUT ALL THE DIFFERENT LITTERS?? In recent years, there has been a considerable expansion in the different types of litter products available to cat owners. New cat owners as well as veteran owners are a little overwhelmed by the different choices available. A number of products have been put out in recent years by fortune 500 type companies, trying to get a piece of the litter market. Their hallmarks seem to be fancy packaging, very inexpensive material source, heavy advertising, and high profit margins. When you buy these products, you may take pride in the fact that you have contributed substantially to the financial success of these large corporations. Commodity prices for corn = 7 cents/Lb., wheat = 10 cents/Lb. Source: USDA.gov, Feb, 2015. Crystal Litter is not some high-profit low-performing litter made from by-products such as ground corn/cobs, ground wheat, pine shavings, old newspapers or walnut shells. These odor destroying crystals are made from silica sand, a natural earth mineral, and are produced through an advanced manufacturing technology. Clay is the old original. This is the most economical decision. This is basically absorbent clay dirt. Drawbacks: Lack of Odor control, Dusty, tracking, frequent changing, weight used per month high. Clumping (scoopable) is specially processed clay that forms clumps when liquid is added to it. The clumps and droppings are scooped and discarded leaving behind mostly fresh litter. Clumping litters account for over 60% of all litter usage. Primary benefits: More odor control than clay, less lbs per month, change less, convenient. Drawbacks: Some tracking, some dust. Crystals are a relatively new product whose primary benefit is super odor control. These crystals contain millions of microscopic pores, which exhale moisture from cat urine. Crystals are essentially processed sand and are environmentally friendly. Primary Benefits: Super Odor control. Contains no crystalline silica (a suspected carcinogenic). Lasts an average cat three weeks or more (but you should scoop daily). Drawbacks: Slightly more expensive than clumping on a monthly basis. Crystals should be stirred about regularly to maximize useful life. *One bag lasts one cat one month. This claim is made by almost every crystal litter out there. It works like this: First of all, the litterbox should be filled to a minimum depth of 1.5 Inches to (ideally) two inches (8 cm) for the crystals to function optimally. So, if you have a small litter box and a small cat or kitten, one bag will last a small cat or a kitten about one month. For a great big cat with a great big bladder, it will be less. Also, individual habits vary widely in regard to how often the litter is changed. Damp environments, such as a bathroom where the shower is used often, shorten the useful life of the crystals. So the 1 bag 1 cat 1 month claim is affected by many variables and is true only in ideal circumstances. The more accurate way to state the case would be to say that if the litter box is filled to a depth of two inches (using more than a 4 lbs. bag in most cases) and is stirred about regularly, it will last the average cat about a month, and will give you far superior results in terms of an odor free home environment for your family, guests and pets. BEWARE! CRYSTAL BLEND, MIX, etc. – A marketing gimmick. These are usually clumping litters with about 5% added crystals. They should be categorized according to their main component. They do not function like crystal litters. Any litter called “Crystal Litter” should contain 100% SiO² Crystals. There are many choices here. Alternative litters are made from various products, such as wheat, corn/cobs, pine shavings, charcoal, recycled newspapers, walnut shells and various other substances. Some of these litters have been treated to provide some minimal clumping properties, but the clumps are fragile and disintegrate readily, thus defeating the benefit that comes from clumping clay litters. Because there is such a variety, you are urged to investigate further any products that appeal to you. Most have a website. Primary Benefits: Ecology and usually contain no crystalline silica, a suspected carcinogenic. FINALLY, WHAT IS LITTERBOX ODOR?? How do crystal litters deliver best odor control? (Short answer: Like magic!) Absorption is what happens when a sponge soaks up urine. The urine remains in the sponge unchanged, and the odor still emanates from the sponge, just as occurs with other cat litters. Think about this. This odor is caused by the molecules that emanate from the cat’s eliminations. Your sense of smell tries to protect you by letting you know that you are inhaling these odorous molecules. You do NOT want your family and guests inhaling these molecules continuously over their lifetimes. It has to have an effect. Get the benefit of Fresh Magic’s space age technology. Why are there different sizes and shapes of Crystal Litter? ROUND is specially designed for use in automatic (electric) litterboxes, such as Scoopfree® and littermaid®. Many users with standard litterboxes also prefer round because it has a slightly longer useful life, and is more gentle on the cat’s paws. The only drawback is that the crystals roll far on hard surfaces if displaced by a playful cat. CHUNK style is generally preferred for standard litterboxes, although some use it in automatic (electric) litterboxes. The irregular (chunk) shape crystals will not roll far from the box if displaced by a playful cat. They track less than other litters because of their larger size. Fresh Magic crystals are sized 2 – 8 mm. Any pink or red color in the urine should be reported to your vet immediately. Many customers have told us that they have been able to detect and minimize the effects of urinary tract problems because the pure white crystals gave them an early indication of a problem.